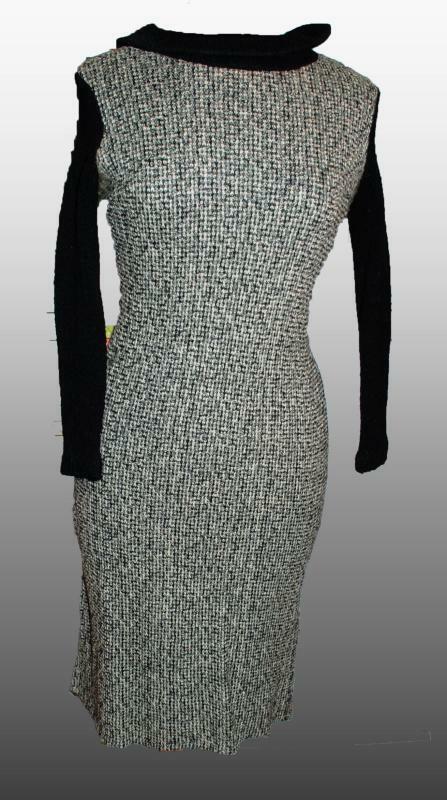 Woven Tweed Dress Black White, Gray Lined with Knit Sleeves and Collar size 11. with metal zipper Looks like from the 60's. There is only the siize tag. Feels like wool and the lining is acetate. The hem is let down all the way so it can be shortened if desired. ( it only folded under and stitched with bias tape. Laying flat from pit to pit is: 17.5" The waist is: 13.5" hips: 15" length from should to hem is: 49"
The condition is very good. No holes or stains.